A young girl is found dead in the woods. One of the prime suspects is the girl’s mother, a city councilman’s daughter with a secret life. But she’s not the only one with something to hide, as Detective Mallory Black soon learns as she searches to deliver justice for the child. Vigilante Jasper Parish wakes up to find himself in a strange town, in a relationship with a woman he doesn’t remember. As memories start to return, he realizes that he’s been hiding a double life from himself — a life where he is happy with this woman and her daughter. Jasper begins to wonder if perhaps this is his chance at redemption. A chance to give up his quest of murder and vengeance. A chance for a life of hope. But Death isn’t done with Jasper. He soon finds himself drawn back into a world where it’s kill or be killed. A world with no hope. 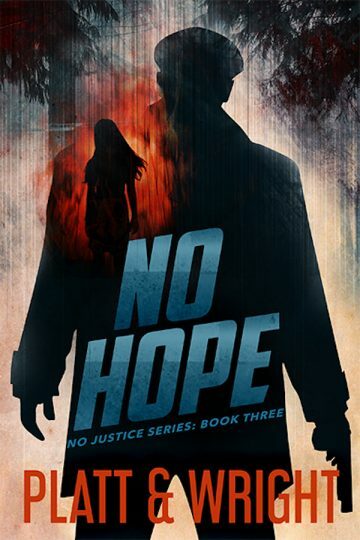 No Hope is the third in a series of standalone thrillers of the No Justice series from bestselling authors Sean Platt and David Wright.